The recruitment will be done on All India Basis. How to apply-Apply on the prescribed format of application. 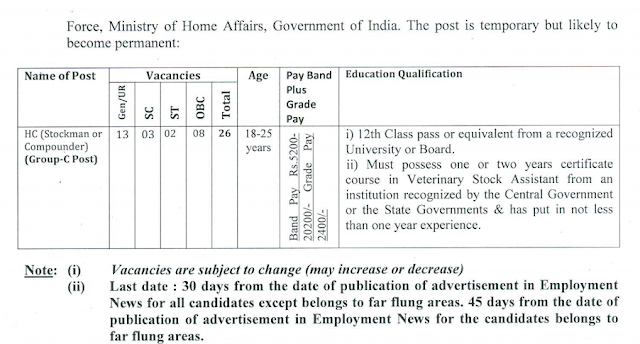 Write on the top of envelope-Application for the Post of HC (Stockman or Compounder) in Veterinary Setup of BSF-2016. Height for male-165 cms and for female 150 cms. Chets for male-76 cms unexpended and expended 81 cms. Language Test-10 marks,General Awareness-20 marks,Numerical Aptitude Test-10 marks and Reasoning-10 marks.Total-50 marks.